Big or small, we’ll connect you. Are You Ready for Energy Independence? At CR Solar, we understand why people continue to use expensive, unreliable grid electricity: traditionally, installing photovoltaic solar panels was an expensive, complicated undertaking. Not anymore! CR Solar provides modular solutions to fit virtually any budget and best of all, because of the way we’ve designed our solution and our services, you can start small to capture savings immediately and use that savings help you grow your PV system to the right size for your home or business, without the hassle of re-engineering the entire solution and/or re-purchasing expensive components. Let us help you connect to the sun and bask in its glow of free energy. Which type of solution is best for you? CR Solar offers more than photovoltaic (PV) solar panel solutions. We offer a clear and affordable path to energy independence. Unlike other companies which provide all-or-nothing solutions that can be complicated and expensive and take years longer to break even, CR Solar provides solar energy solutions that can grow letting you start saving money today, and letting you use that savings to expand your system to save even more. 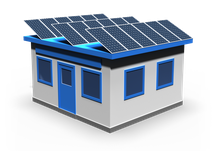 Every PV solar panel installation that provides electricity directly to your home or business will include an electrical component called an inverter. An inverter converts the direct current (DC) from the solar panels into alternating current (AC) required by a home or business’ appliances, and, if the panels connect to the National Grid (“grid-tie”), the inverter must meet a number of performance criteria and specifications. In traditional PV solar panel installations, a single, expensive inverter is used for the entire system and must be properly sized to match the number of panels and their expected level of output. The panels are then connected together electrically in series to connect to the inverter. The single inverter design comes with a number of serious problems. Dangerous - With all of the panels connected to the same inverter in series, dangerously high levels of direct current is created requiring heavy-duty and more expensive cabling, shielding, protection from corrosion and fencing to protect people and animals. This significantly raises the initial cost of installation, the ongoing cost of maintenance and just generally presents ongoing concern. Intractable - Should the owner wish to expand their system, the existing inverter will likely need to be replaced. This greatly raises the cost of the expansion. Flexible - Expand your PV solar solution at any time. Simply connect another panel and its immediately part of your system. CR Solar even offers a cable trade-out program to make sure you're not left with some cables that are no longer the right length. CR Solar energy solutions meet all required Costa Rica specifications and are 100% certified for connection to the National Grid. 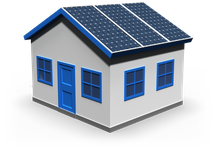 Home Energy Solutions CR Solar home en­ergy so­lu­tions are easy, af­ford­able and safe. Business Energy Solutions En­ergy costs can be one of a company’s largest expenses, elim­i­nate this cost for higher prof­itabil­ity or to po­si­tion your com­pany for growth. An unexpected benefit was the large amount of garage space that was recaptured when the old water heater was removed. Fantastic! The project was completed in the afternoon and we had hot water later that evening. [CR Solar] managed everything professionally and the project was completed exactly how it was presented and quoted. Watching that electric meter run backwards is pure joy! CR Solar did the install and they did a beautiful job. The work of installing 20 panels was done quickly and everything is very neat and tidy. The system is generating all the electricity we use on a daily basis plus use of the hot tub once per week.